Decent Exposure Photographics has moved into the area of Stock Photo Images. These images are requested by Photo Editors and businesses from around the world. Michael Overacker shoots images that he feels are most marketable and best displays the strong points of his shooting style and then files them and makes them available for interested buyers. Michael Overackers images have appeared in national and international magazines, brochures, books, and publications. Many of the images below were taken along the Blue Ridge Parkway. Michael Overacker has spent a great deal of time on the Parkway shooting images. 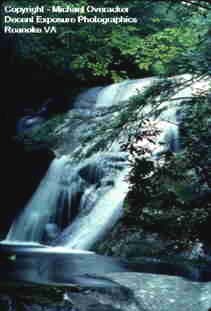 He also teachs photography along the Blue Ridge Parkway as a VIP Ranger. Below are a few examples of Michaels work in the Stock Image field. The above left image is Sharp Top Mountain of the Peaks of Otter on the Blue Ridge Parkway near Bedford Va.. The above right image is a sunset from Buck Mountain on the Blue Ridge Parkway in Roanoke Va.. The above left image is a wildflower at the Roanoke Mountain Campground, an excellent camping area on the Blue Ridge Parkway Spur Road in Roanoke Va. The above right image is a Red-Tailed Hawk, photographed on the Blue Ridge Parkway near Roanoke Va.. 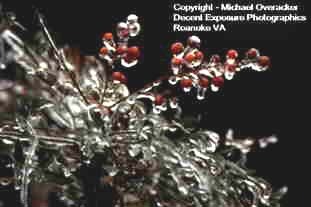 The above left image is ice on berries in a neighbors yard during an ice storm. 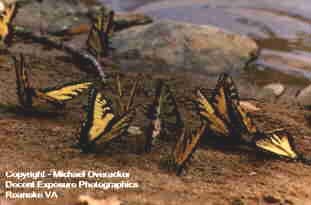 The above right image is migrating butterflies that have paused next to the Roanoke River in an area that is now the Explore Park on the Blue Ridge Parkway in Roanoke Va.. 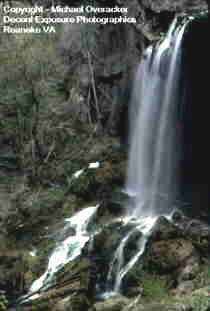 The above left image is a waterfall on US 220, north of Covington Va.. The above right image is a waterfall below Bald Mountain NC on the Blue Ridge Parkway. 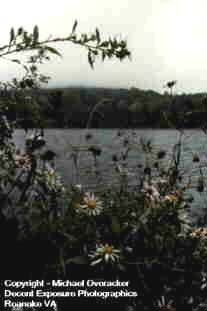 The above left image is wildflowers around the Peaks of Otter Lake on the Blue Ridge Parkway. The Peaks of Otter mountain, Sharp Top, would be in the background except that it is shrouded with fog. 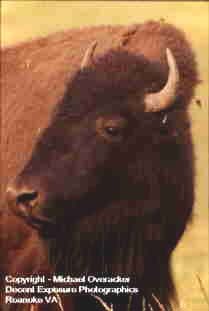 The image above right is one of the Buffaloes that is part of the Explore Park on the Blue Ridge Parkway in Roanoke Va..